Pacific Union is pleased to announce that we have acquired Empire Realty Associates in Danville, the next step in our journey to becoming the ultimate California real estate company. Empire Realty Associates was founded in 2002 by current CEO and Chairperson Judi Keenholtz, who helped establish Pacific Union’s first presence outside of San Francisco in 1989, when the company hired her to lead its expansion into East Bay real estate markets. Since then, Keenholtz has grown Empire Realty Associates’ operations to 54 real estate professionals, who closed $443 million in sales in 2016. The acquisition is the third move in the past 10 months for fast-growing Pacific Union, as the company actively seeks to expand its market reach in one of the United States’ hottest real estate markets. 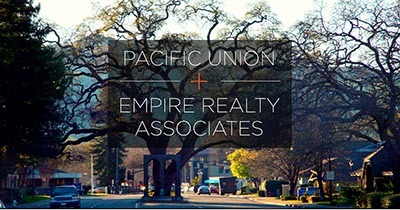 As America’s eight-largest U.S. residential real estate brokerage based on 2016 sales volume by both REAL Trends and RISMedia, Pacific Union expanded its geographic footprint by merging with based John Aaroe Group in December 2016 and Partners trust in August of this year, both based in Beverly Hills. The company now has 47 offices in Northern and Southern California with more than 1,450 of the state’s top-performing real estate professionals. The acquisition positions Pacific Union as the preeminent California residential real estate brokerage, with 2016 sales volume of $13.06 billion. With the addition of Empire Realty Associates, the company projects 2017 sales volume results of more than $18 billion. Empire Realty Associations will continue to operate under its current name until 2018, when it will be rebranded as Pacific Union International.